The series taken from the beloved children's books and adapted into the biggest movie franchise in history is coming to a close with Harry Potter and the Deathly Hallows Part 1. As sides clash, characters embrace their destiny and studios rake in the dough, we get the feeling something special is ending. So, where does the seventh Harry Potter movie rank in the series? The second movie picks up some time after the events of the previous film, with the gravity of the situation in full force as the Minister of Magic (Bill Nighy) tries to convince everyone, including himself that everything is ok. As a result, Harry's relatives pack up and leave; Hermoine leaves her parents, making them forget their daughter ever existed, and Ron is left contemplating whether his family will make it out alive as they gather for a wedding. Once we get the intro, we are treated to one of the best action scenes in franchise history as Harry's friends try to transport their most valuable cargo to a safer location. Things go terribly wrong; brooms fly, and good and evil do battle in the skies as Harry tries to get away in Hagrid's side car. This was my favorite part of the movie with some great scenes, and gorgeous action shots. 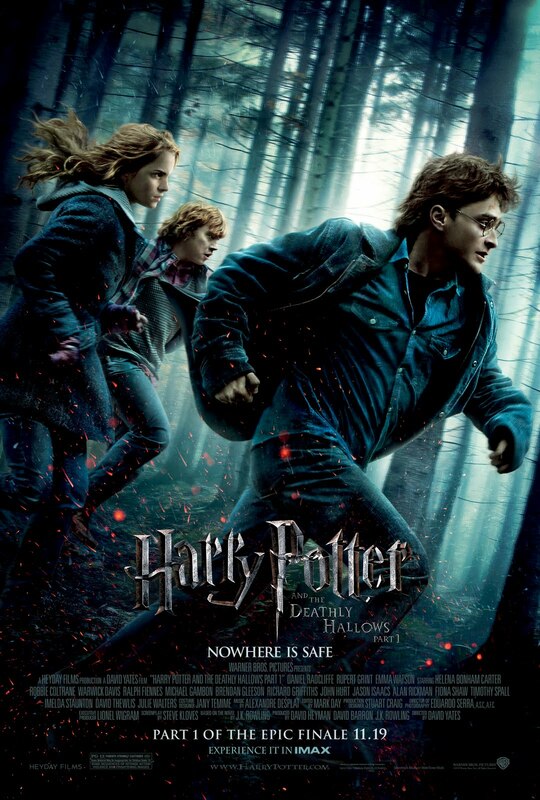 We get a quick lull in the action before another death eater attack leaves Hermoine, Ron and Harry on their own, and on the run. As someone who has never read the books, I always feel like there are stories hinted at that are never fully realized in the movies, and this one is no exception. Dumbledore's mysterious past is referenced, but left in the background. There were hints to movies past, from mention of the Basilisk in Chamber of Secrets, to the Sword of Gryffindor, and the golden snitch from the first quiddich game. The actors only get better with age as you get the feeling Emma Watson, Daniel Radcliffe and Rupert Grint are as comfortable in their characters shoes as they are in their own. Radcliffe especially flexes his acting chops with several scenes of intensity in a CGI heavy scene. Ralph Fiennes has a more commanding performance than the last movie, playing the dark lord himself, and Helena Bonham Carter shows her normal crazy side in a rather brutal scene involving Watson's Hermoine. This movie shows it's no longer for kids with torture, death, and a pretty hot scene involving Harry and Hermoine. While there are several bright spots in the series, Goblet of Fire being my favorite, this has to be lower on the list for me. The grayness in the movie, meant to enforce the weight of the world left me depressed. There were some amazing, beautiful, dramatic scenes, but at 2 hours and 36 minutes, I started to notice the length at times, specifically in the middle. With the action packed beginning and the dramatic end, littered with just a hint of humor, like scene with multiple Harry's, or any time they change shape, the middle, with all its scenery, and emotion packed dialogue dragged. It seemed they just teleported from one beautiful location to another without any point or purpose with tidbits of swords and the origins of magic spread throughout their travels, with the radio spreading news of death in the background the whole way. Overall, any Harry Potter fan will be flocking to see this movie no matter what I say, and the movie will set box office record after box office record, but in the end, I don't think this will be my favorite. With the grim feeling, and depressing backdrop, this movie won't beg for the repeated viewings the others will. Either way, Harry is more than worth your time. It's beautiful, wonderfully dramatic, with a hint of humor and some nicely done action. See it; if for nothing else, to see the buildup to the ending we've all waited for since meeting that young boy all those years ago.